for me. For them, this job is no lark; they understand how dangerous it can be if certain rules aren't followed and precautions taken. Every aspect of underground construction and maintenance work, from the overall design to the shoring of trenches and tunnels to the modes of entry into the work site, needs to be carefully planned and well-executed to insure the safety of workers. Today's workers benefit from many more safeguards than existed in the past, but since these systems are designed by fallible humans, errors and accidents can always happen. sewer pipes, these arteries are what make a healthy city possible, one providing its clean life-giving "blood" and the other removing away its disease-laden waste. Watching that life blood spurting high into the sky from a gash in the street, or peering down into a gash and seeing and smelling what we thought had been safely and finally flushed away, can be disheartening for city dwellers. No one wants to be reminded that the ground we daily walk is not as solid as we think. At their most innocuous, accidents or cave-ins during the building process, or collapses of underground structures after construction, swallow up cars and sidewalks, leave gaping holes in city streets, and provide city dwellers with a pointed (and in the case of sewer collapses, pungent) reminder of the infrastructure they otherwise take for granted. At their worst, however, such incidents are deadly. In researching the history of the city's water filtration system, constructed between 1901 and 1911, I found a matter-of-fact list of 14 lives lost in the construction of the Torresdale Conduit. A telling feature of this official list is that while the dates of each incident were noted along with a brief description of the cause of death, no names of the deceased workers were included. The dead were likely low-paid, probably immigrants--certainly, if an inspector or official had perished, the report would have mentioned his name! The anonymous sacrifice of 14 was seen as a sad but necessary part of creating a safe water system that would ultimately save thousands of lives. Newspaper stories, of course, listed names and occupations of those who died and were injured in the prosecution of these massive public works, or in the collapses that sometimes came decades after the construction was complete. As someone who wrote my share of obituaries for a small-town newspaper (one of my duties as a staff reporter), I can say that one role of a newspaper is to both memorialize the deaths occurring among its readership, and to inform neighbors of these sad events. I looked obituaries as providing what in many cases was the only public recognition this person had ever gotten, their posthumous 15 minutes (or more like 15 milliseconds) of fame. But obituaries, and even news stories about the dead, are often brief, objective, to the point, rarely dwelling on their effect on families, on neighborhoods, on individuals. This may be why I found George Shotzbarger's account of the death of Joseph Reiss so moving, and I'll let him tell the story from here, as he told those gathered at the dedication of Patrolman Reiss's hero plaque on July 22, 2010. On 8-1-1959 at 10:51 P.M., he was dispatched to investigate water coming from the highway. The street caved under him at 5th and Clearfield Streets, and he went into the sewer system. Officer was not found until 8-8-1959, when his body was discovered at Richmond and Somerset Streets. Thursday, July 22, 2010, at 11:00 A.M.
Good morning, everyone, and thanks for attending today's long-overdue memorial ceremony for Patrolman Joseph Reiss. Special thanks go out to Adam Levine, archivist for the Water Department, who's here today, for helping me in my research on the death of Officer Reiss. I'm also grateful to Jimmy Binns for that kind introduction. When I met with Bob Ballentine of the FOP last week to finalize arrangements for today, he extended me this opportunity to speak, even though he knows - no doubt better than most people - how dangerous it is to give an audience to any attorney, even a retired one. But Bob and I go back a long way, to the 1980s, when we worked together on a few cases. He was a detective in the Homicide Division then, while I prosecuted murder after murder - many of them committed right here in the 25th District, where I grew up. I'm both pleased and privileged to have sponsored today's plaque dedication. I've attended a few of these events before, either because I've known the fallen officers themselves, or because I've come to know surviving members of their families. I'm also a member of Officer Daniel Boyle Division 88 of the Ancient Order of Hibernians, founded in 1992 as the very first AOH division, nationwide, named after a fallen policeman. Now, there are many, which is kind of a "bad news / good news" development, I suppose. These plaque events provide both fond and bitter opportunities to reflect upon brave service and ultimate sacrifice. When I joined then-Detective Pat Boyle at the plaque ceremony for his only son at 8th & York Streets (and he's here today right over there with my brother Jerry, the Jury Commissioner), it occurred to me that I might, and perhaps even should, sponsor a plaque. It was then, in the brilliant sunshine of North Philadelphia, that I decided upon Patrolman Joseph Reiss, who died so horribly, so many decades ago. I figured that we who work or have worked in law enforcement could mark his untimely demise 50 years after its occurrence. We may have kept to that original timetable for last summer, had the bad guys and career criminals not declared "open season" on Philadelphia police over the past few years. And we may have performed this ceremony right where Officer Reiss gave his life, but - alas - the old neighborhood just ain't what it used to be. So here we are today, at last - better late than never, and better here than nowhere. On August 1, 1959, I was just a pint-sized 7-year-old, enjoying my carefree summer vacation, when Officer Reiss went down - literally - at 5th & Clearfield Streets. Although my parents, my neighbors on the 30 hundred block of North 7th Street, and my parochial school nuns considered me a "holy terror," which I readily admit I was, I'd somehow managed to avoid all contact with the "red cars" and the men in blue. So I never knew Officer Reiss. I was busy at the George H. Thomas public schoolyard, Franklin & Clearfield, learning how to play checkers and "chink" - a simple game involving a ball, a wall, and some pals as opponents. My father was walking my older sisters and me to 9 o'clock Mass on Sunday morning, August 2nd, when he figured out that something was very wrong. There was three times the normal traffic westbound on Indiana Avenue, as a result of the sewer collapse on 5th Street. Once we were in church, moreover, the old German priest asked all of Saint Bonaventure Parish to pray for "that poor policeman" who got caught in the terrible cave-in of the previous night. Needless to say, my dad stopped at the corner store and bought the Sunday morning paper to see exactly what had happened. The news was horrific, of course, and day by day it didn't get any better. For a young lad like me, it was the strangest, most memorable week: one "watershed" moment after another. For example, we weren't allowed to take collected newspapers to the junkman on the 31 hundred block of 5th - which is how we used to earn our money for baseball cards, candy, and snow cones. We had to walk a different route to the pool at Mann Recreation Center, 5th & Allegheny. We remained on "close watch" outside our house, because the City decided to switch the one-way direction of traffic on 7th as a northbound detour to 5th Street, which would remain closed for months as the Streets and Water Departments repaired the huge sewer line and hole in the ground. The wives and women prayed and cried for Officer Reiss, his widow, and his children. And the men? Well, the men finally had something to talk about besides how much the last-place Phillies were stinking up the National League. There was, simply put, a new stink to discuss: even two blocks away, on certain days, we could smell the sewer water, especially because the collapsed cobblestones had effectively dammed up an underground stream, originally known as Gunner's Run. The men, though, were hardly complaining about the foul odor. Like Officer Reiss himself, they had all fought in either World War II or the Korean Conflict. Many of them had received medals like the Bronze Star, Oak Leaf Clusters, and Purple Heart that Officer Reiss had earned. They were battle-tough and brutally taciturn. They knew that "loose lips sank ships," and so they never, ever, talked about the war, or anything else of a serious nature. My father was probably king of the "silent types," which makes perfect sense to me now. After all, he had served with the OSS for a few years after his stint in the Army Air Corps during WWII, a fact I didn't learn from my aunts until he'd already been dead for ten years or more. The grown-ups, however, wouldn't stop talking about Officer Reiss, and how it was a such a damn shame that all those police, firemen, and sewer workers wouldn't just go down into that "culvert" and retrieve the dead cop's body. Misters Prouse, Forbes, Devine, Jones, Carr, Fedyna, Imwald, Rowan, Anderson - all of them - had been trained never to leave a brother-in-arms behind, but here the City seemed not to care about Officer Reiss enough to go down - despite the risks - and get him the heck out of there. They said they'd do it themselves, if the City would only let them. I can't know whether that level of neighborhood concern offers any consolation to the surviving family members of Officer Reiss here today, but the men in Fairhill were aghast at the eight days it took for the City to locate his remains. Finally - on Saturday, August 8, 1959 - underneath the intersection of Richmond and East Somerset Streets, Officer Reiss was found and retrieved for burial. He was less than two blocks away from being swept into the Delaware River and out to the open sea. Since then, I've often wondered how he wound up so far away, over two miles distant, from where he first went down. The answer lies in Philadelphia's now-hidden streams. Gunner's Run was no Wissahickon or Pennypack Creek, but it did drain almost all of Nicetown, Fairhill, Upper Kensington, and Port Richmond. Through Fairhill it once ran where Clearfield Street now sits, in a valley. For the officers here who still patrol the 25th District, survey any of the numbered streets from 5th through 9th: you'll notice that Lehigh Avenue and Somerset Street - where Fairhill Square and Fairhill Reservoir are located, respectively - form pretty much a high point or plateau. Heading north from there, all the streets plunge down to Clearfield and then climb up steeply again to Allegheny and Glenwood Avenues. A natural crease in the land, with a natural creek bed. As the City expanded during the Industrial Age, it built a 15-foot, 2-course brick channel enclosing Gunner's Run and therefore making the area around it easier to develop into factories, railroads, and rowhouses. Built in 1878, it was designed to support the traffic of the day, mostly horse-and-buggy. There were no tractor trailers or even trolley cars back then. To their credit, the masons who constructed that sewer line did one heck of a job, for it lasted almost 80 years before the tragic cave-in of 1959, when 5th Street was carrying tons of modern vehicles throughout day and night. Meanwhile, Gunner's Run - named after the old Swedish settler, Gunner Rambo, whose farmstead it traversed - kept pouring nearly 14,000 gallons per minute in dry weather, much more after a rain. Indeed, the most recent collapse of that same relief sewer occurred in November of 2003, right at Hissey Playground near 'C' Street & Indiana Avenue. Fortunately, no children were playing there at the time. Officer Reiss, of course, was not so lucky. Because of his horrible death, I learned early on that those wearing badges face deadly peril from Gunner's Run as much as from gunners who run. I learned to look both ways before venturing into the street. I learned that my dad and the men on our street were not actually so stoic as they generally appeared to be, but had emotions just like my mom and her friends. I learned that topography remains topography, even when it's bricked or paved over, and that gravity and erosion are relentless forces. I learned to sprint across Clearfield Street as fast as I could when visiting my buddies up on the next block, friends like Officer Dennis Kaisinger - may he rest in peace as well - who served here in this District his entire career. I also learned that surfaces are merely veneers, and that places and people alike have much deeper aspects to them, which become visible only when the unthinkable somehow occurs. Today I pay my respects to the heroic policeman who inadvertently, tragically, taught me those things. Every life causes a ripple, and every death a wave. May Officer Joseph Reiss rest in peace, and may this plaque we lay here today remind us of him - and that - always. 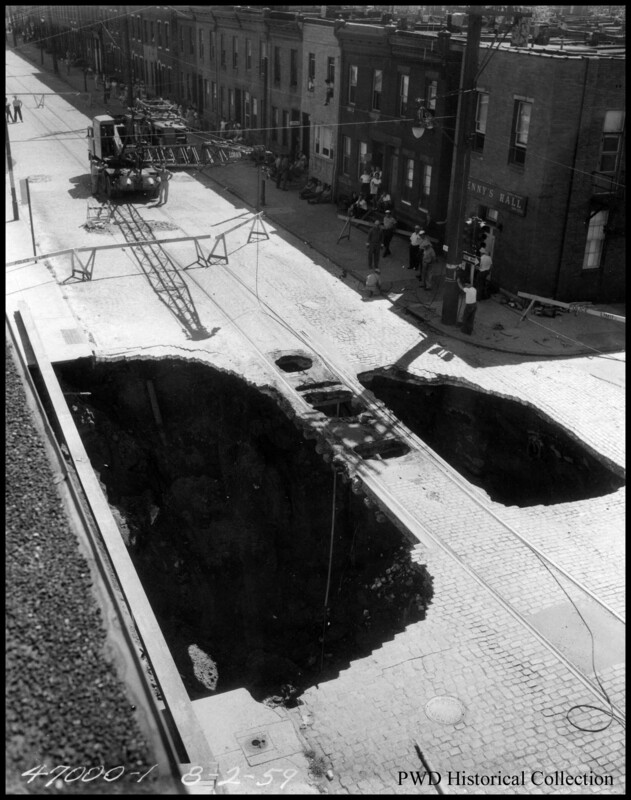 5th and Clearfield, Philadelphia, the morning after the Gunner's Run Sewer caved in. Patrolman Joseph A. Reiss died when he fell into the pit while investigating the collapse. To see photographs of the Reiss plaque dedication ceremony in the "Peace Officer,"
visit this link and go to page 123.